Design parameters (top) of four-helix bundle (bottom) capable of light-activated charge separation. In the immortal words of renowned physicist Richard Feynman, "What I cannot create I do not understand." Scientists at the Photosynthetic Antenna Research Center (PARC), an Energy Frontier Research Center, have taken this philosophy to heart. They have created a model protein to explore the mechanism by which the first photosynthetic proteins facilitated charge separation. Photo-induced charge separation occurs when light is used to excite an electron from a molecule. This generates a positive and negative state simultaneously. Understanding and using this biological process may help scientists improve the efficiency of producing fuels, medicines, and other high-value products. Light-induced charge separation is critical for life as we know it. In nature, the entire food chain depends on this process. Photoarrays in plants and bacteria, collect the sun’s light energy and funnel it to photosystems. In a process known as photoreduction, the photosystems act as converters, turning light energy into electrical energy. The electrical energy is used to reduce carbon dioxide for the production of fuel for the cell. This elegant yet complex system is a biological blueprint for a future powered by renewable energy. Creating a system that uses light energy to convert carbon dioxide into fuel is very attractive to scientists as it represents the possibility of an inexpensive yet environmentally responsible energy system. For charge separation to occur in proteins, redox cofactors, or small molecules that can lose or gain electrons, are necessary. These cofactors enable chemical reactions to occur that would be difficult with only natural amino acids. Natural redox proteins, proteins that contain redox cofactors, are often quite complex and therefore difficult to study. To more directly study the mechanisms of redox proteins, PARC scientists designed a simple, water-soluble, four-helix bundle protein. The protein contains an unnatural redox-active amino acid: napthoquinone. The protein also binds a zinc porphyrin, a colorful cofactor that can donate electrons when excited. 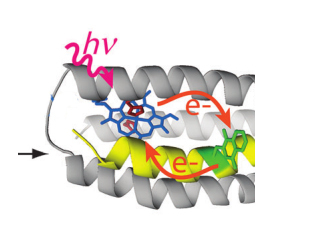 In this protein, absorbing light excites a porphyrin that hands off an electron to the napthoquinone to generate a charge-separated state. Transient absorbance spectroscopy, an analytical technique, was used to show that the charge-separated state survives approximately 100 microseconds. The longer the charge-separated state lasts, the greater the efficiency of converting light to electrical energy. This work represents a step on the path to designing proteins that surpass their natural counterparts. To achieve that goal, future work will examine the effect of using different porphyrins to enhance the lifetime of the charge-separated state. Once this protein is optimized, it could serve as the power source for producing fuels like hydrogen or methanol. However, that is just one facet in which these designed proteins could be useful. By capturing light energy and funneling it into the right proteins, it is easy to imagine a future where scientists can design proteins with distinct functions that can combine to perform complex chemical reactions. This research was supported in part by a European Research Council grant that funded molecular biology and the U.S. National Institutes of Health, General Medical Institutes that funded biophysical characterization of the designed proteins. 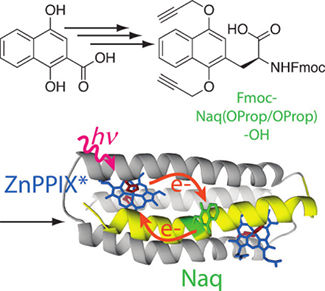 The U.S. Department of Energy, Office of Science, Office of Basic Energy Sciences, Energy Frontier Research Center (Photosynthetic Antenna Research Center) funded the synthesis and characterization of the synthetic naphthoquinone and its assembly in the protein with a photoactive zinc tetrapyrrole. S. Garrett Williams is a graduate student in the Department of Chemistry at Arizona State University, under the supervision of Anne Katherine Jones. He is a member of the Center for Biological Electron Transfer and Catalysis (BETCy). Currently, he electrochemically investigates reconstituted [FeFe]-hydrogenases to better understand the fundamental mechanism of redox enzymes. This protein may offer insight into the mechanism by which the first photosynthetic proteins induced charge separation, the first step in creating fuels. Trees and other plants turn sunlight into fuel without using rare minerals or finicky conditions. Scientists are writing the design guide for stripped-down molecules that could one day turn sunlight into fuel to heat homes and run manufacturing plants. The challenge is the intricacy of the steps involved. Scientists have uncovered a new way to design those first steps. They programmed a simple protein bundle to capture sunlight, excite electrons, and move those electrons. Their work writes a new section in the design guide and, one day, could lead to molecules that mimic leaves and create fuel from sunshine. Scientists at the Photosynthetic Antenna Research Center, led by the Washington University in St. Louis, did the research.